To buy, or DIY: That is often the question. Whatever you decide, we've got you covered. Industrial lighting options are available from a wide variety of retailers and price ranges to fit every budget. If DIY projects suit your fancy, there are so many fun and creative ideas suitable for beginners or more seasoned DIYers like yourself. 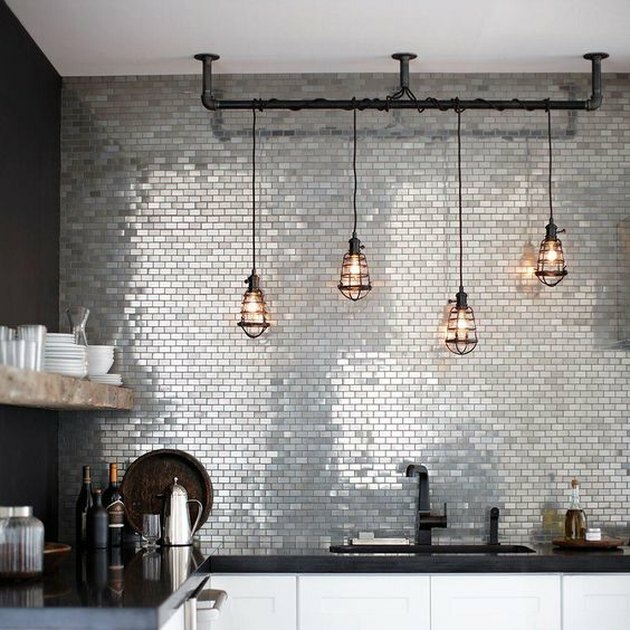 Whether you end up hitting the hardware store, department store, or both, here's a handy list of 10 industrial lighting ideas that you can buy or DIY. An important safety note: For DIYs and retail buys alike, always leave the wiring to a professional electrician. We just adore this snazzy, little DIY wall sconce. Its design is simple, functional, aesthetically pleasing, and this is a great DIY project for newbies. The copper (almost rose gold) finish gives this fixture an elegant look at a fraction of the price. We're also big fans of the way you can vary the appearance of the sconce depending on the type of light bulb you choose, and the way in which you wrap the cord around the bracket. Made in Massachusetts and handcrafted from solid oak, this Dino Sanchez Bracket Lamp ( $350 ) harkens back to a simpler time. The minimalist design, use of honest, natural materials, and the focus on craftsmanship are quintessentially industrial. Mount them in a row down a hallway or solo for a little extra accent lighting in a quaint reading nook. Do you remember paint by numbers kits? Well, this is sort of a DIY by numbers kit. Forget about going to several different hardware stores to hopefully find all of the correct pieces for your lighting project. This beautiful You Make It Chandelier Kit ( $169.50 ) by Lindsey Adelman includes all of the pieces you will need to complete your luminous masterpiece. It's as easy as one, two, three! Unless you're into welding and you're pretty handy with a blowtorch, this fixture might be a little difficult to DIY. Luckily for us, we can forgo the welding helmet and get this rustic 12-light chandelier from Lamps Plus ( $499.99 ) instead. And bonus: The vintage Edison bulbs are included. Before you break out the ladder, be sure to recruit some extra help for the install, as iron chandeliers can be pretty heavy. 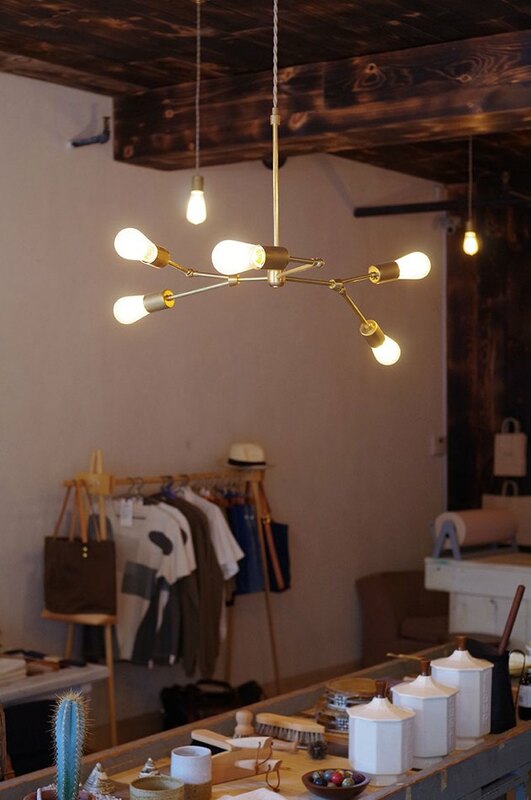 Go ahead and put this industrially chic pendant light from Hello Lidy in the 'DIY win' column. 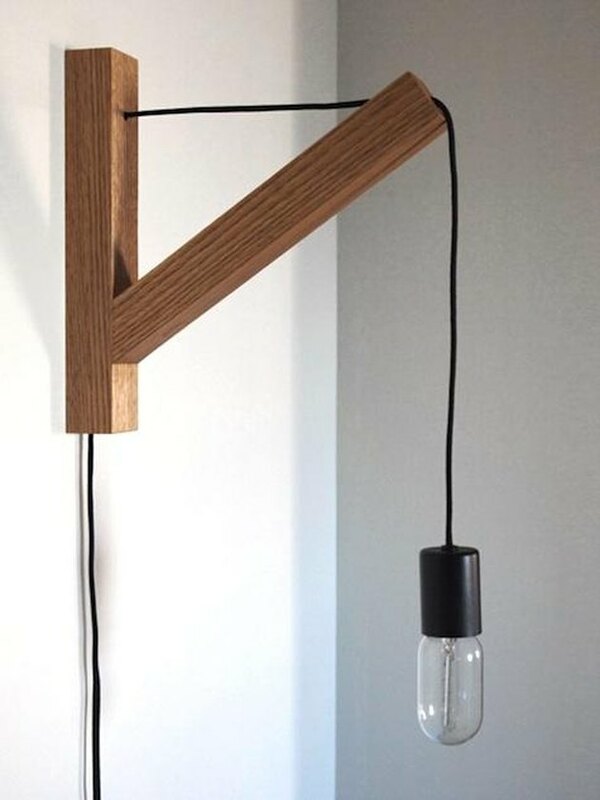 This fixture nails the industrial exposed-bulb look with a modern twist. We love the wooden hexagonal canopy detail, and the fact that you can make this fixture truly unique and one-of-a-kind by using a variety of different bulbs, socket colors, and cord lengths. 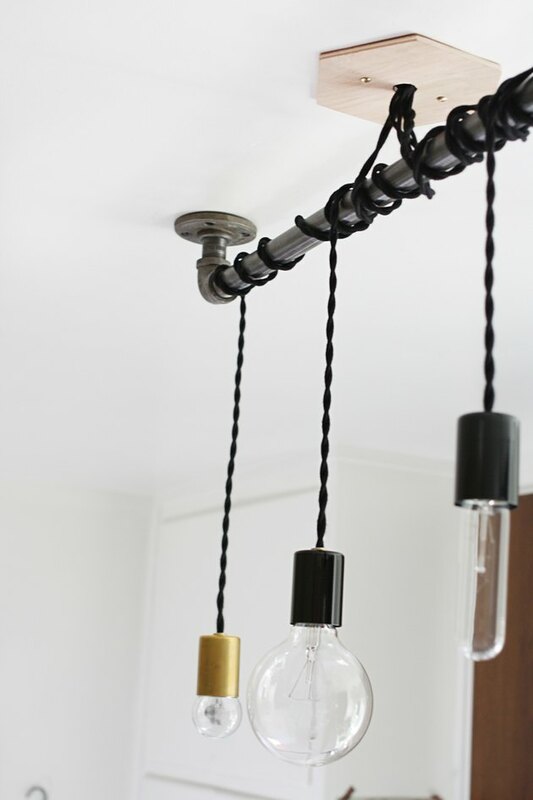 Love the look of a cage pendant, but DIY is not really your thing? No worries, we've got you covered. 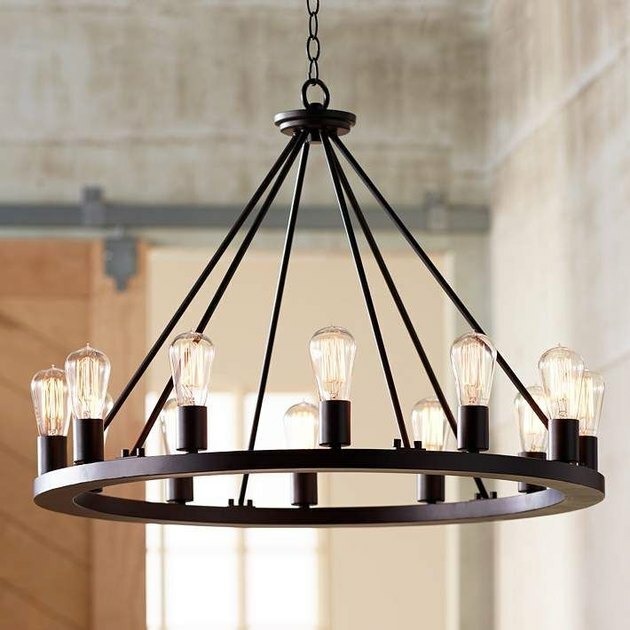 This aged bronze fixture from Home Depot ( $69.97 ) is a very handsome option, and even comes with a six-foot adjustable cord to accommodate varying ceiling heights. Again, make sure that you consult a professional electrician before you handle any wiring. 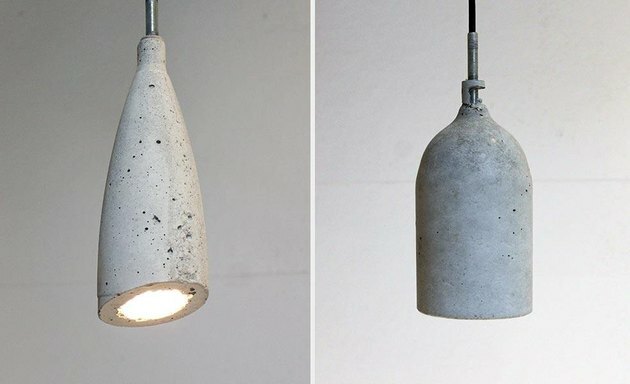 If you ask us, this impressive DIY concrete pendant light made from old plastic bottles gives the pros a run for their money. This ceiling fixture not only looks extremely professional, but it can also be accomplished for less than $10 (excluding the light bulbs and tools). Designer Ben Uyeda, of HomeMade Modern, walks you through the entire process step-by-step, and the end result is industrial sophistication at its best. 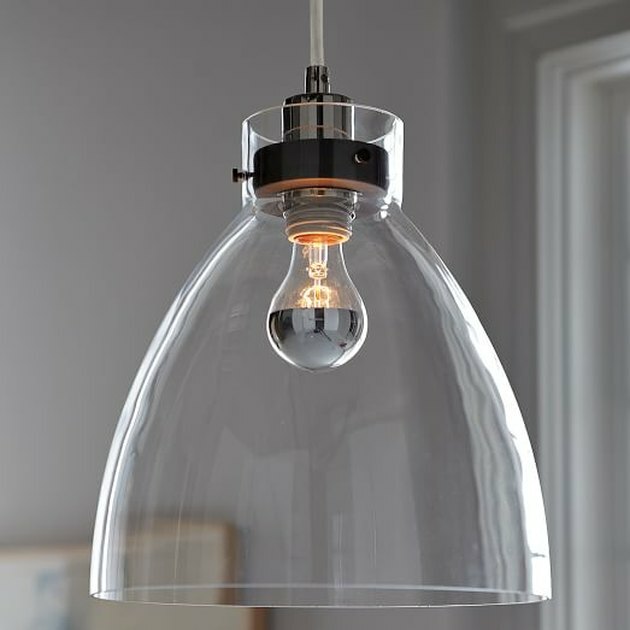 This task pendant lamp from Restoration Hardware ( $229 ) is everything you want in a classic, minimalist, industrial light fixture. The lamp gets its uniquely authentic appearance by mixing metals: Made of iron, the shade has a pewter patina finish, and accents finished in antique brass. Mounted to the ceiling, this 12-1/2" diameter fixture would be perfect above a kitchen island, giving you adequate lighting to display your culinary prowess. 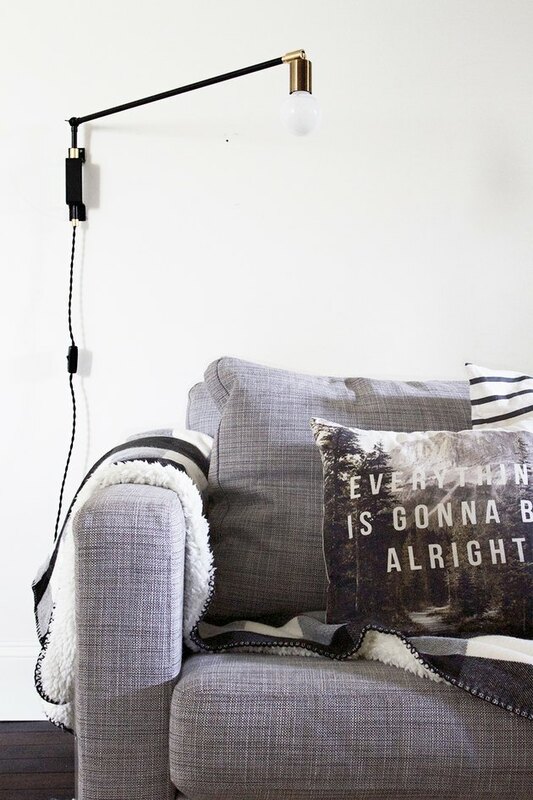 Okay, are you as amazed as we are that this gorgeous swing arm wall sconce is DIY? That's right! Alison over at Deuce Cities Hen House has broken down step-by-step how to recreate this little number for less than $60. 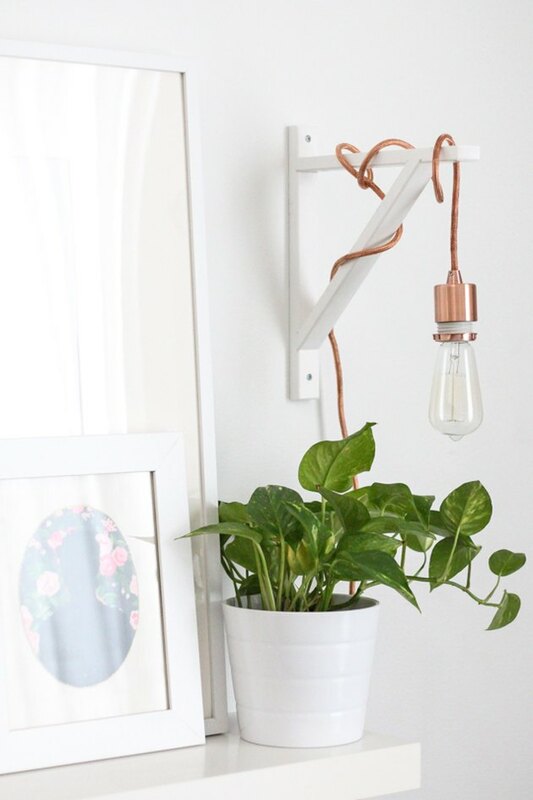 The antique brass socket cup adds a modern edge to this sconce that has us drooling for more. 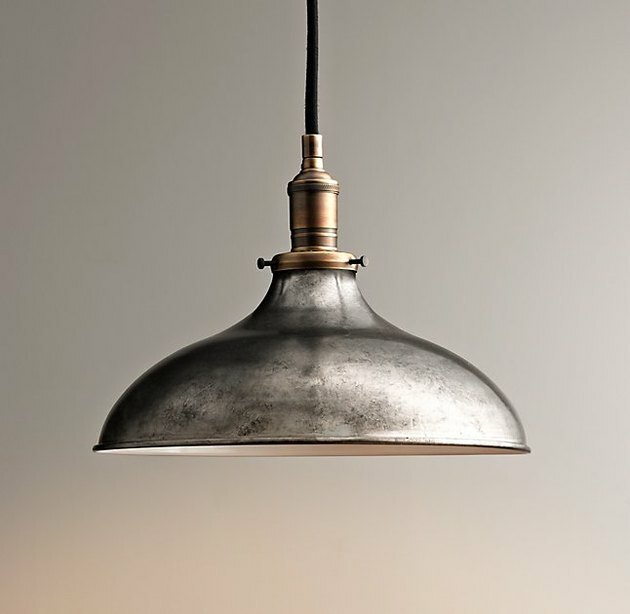 It's hardly surprising that the vast majority of industrial lighting incorporates metal — after all, we're talking about a style that was born as a result of the industrial revolution. However, the traditional bowl pendant light just got a glamorous makeover and we couldn't approve more. 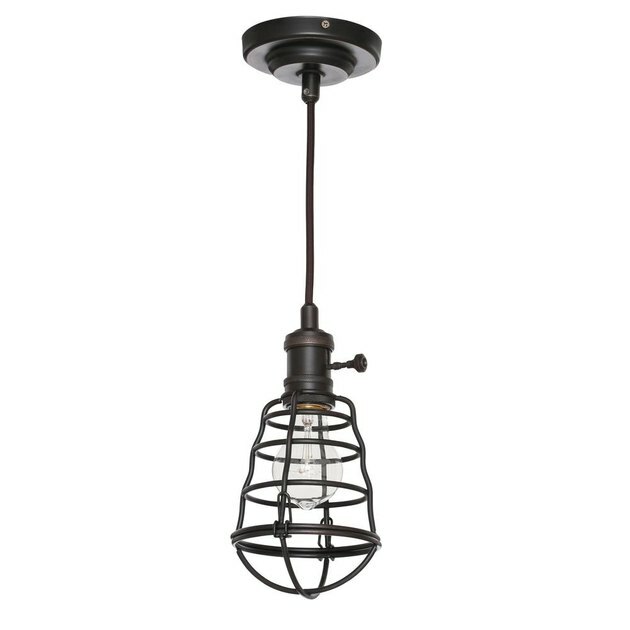 This gorgeous glass shade fixture with antique-bronze hardware from West Elm ( $109 ) offers a timeless new perspective of an old classic.